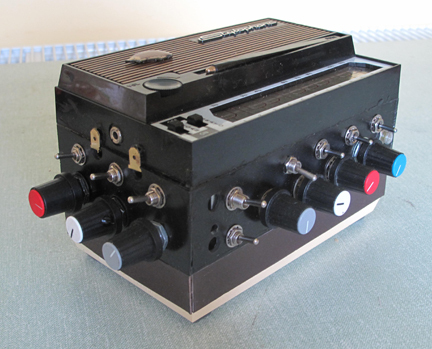 My second modification, and first variation on a classic theme, was initially described by its inventor, Forrest Mimms III, as a ‘Sound Synthesizer’, and later as a ‘Stepped Tone Generator’ before it acquired lasting fame as the ‘Atari Punk Console’, or APC for short. The APC consists of a pair of oscillators, using the ubiquitous 555 timer i.c. : one ‘astable’, or continuous, the other ‘monostable’, triggered by the first. The 556 is often used, as it contains two 555s in one chip. The design is so famous, it even has its own page in the Wikipedia. I remembered that one of the Stylophones in my collection, the 1970s ‘New Sound’, was based on a 555, so decided this could be adapted as the first oscillator in the circuit. Looking around at various implementations of the circuit, I decided an LFO would be a handy addition, so decided to add a 556, to give 3 oscillators altogether. 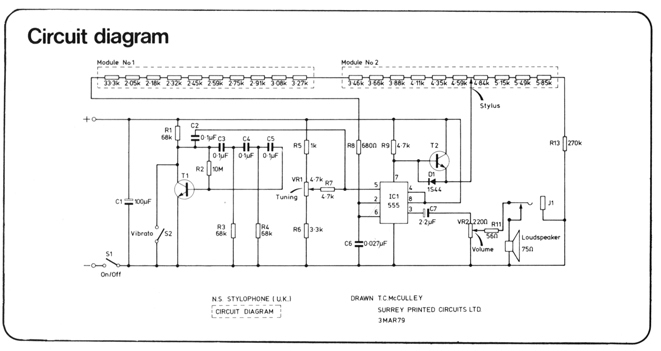 The middle part of the diagram is part of the Stylophone circuit. The other parts were mainly inspired by Forrest Mimms’ own description of the stepped tone generator at www.jameco.com/Jameco/PressRoom/punk.html?CID=punk, the ‘Blast Fed Disaster’ from www.thesquarewaveparade.com, and the article at www.getlofi.com/?page_id=1395, including the Datura Mod. As far as I recall, the 680Ω resistor shown in the circuit diagram as R8, where the circuit was broken for SW1B, wasn’t actually there and was replaced by a wire link in my Stylophone. 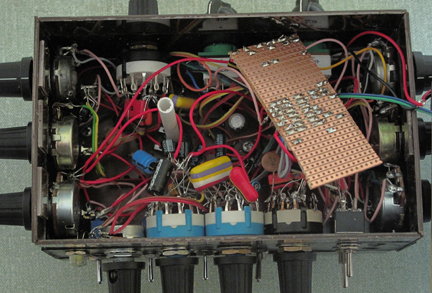 In the end, there were very few components to add to the Stylophone, just lots and lots of pots and switches, and yards of connecting cable. The 556 and one or two other components for decoupling were on a small piece of veroboard, and took up very little room, but the biggest problem I had was to find enough space inside to fit the extra circuit board and all the wires in, and enough space on the outside to attach all the switches and knobs. It was clear from the start that the Stylophone case was far too small to contemplate this. I didn’t want to add a break-out box, or disfigure the Stylophone too much by sticking extra boxes to the side of it, so I decided to extend the depth of the case to create more room. I bought some small pieces of 2mm acrylic, to match the thickness of the original case material, sprayed it black, drilled holes and stuck it in place. It was now more than twice the height of the original Stylophone. Still not deep enough. A couple more centimetres all round of brown acrylic vaguely the same colour as the original ‘natural wood’ finish on top, and it was as deep as it was wide, with switches and knobs poking out on all sides. This is how it acquired its nickname, ‘The Hedgehog’. 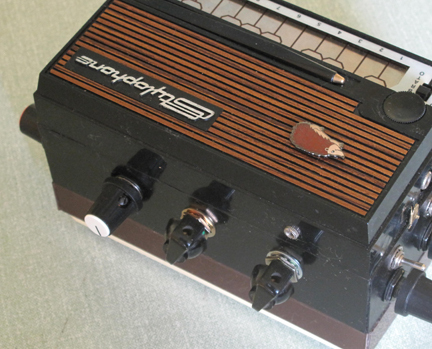 This low-angle shot of the considerably enlarged case of the ‘New Sound’ Stylophone shows most of the controls added to it to create ‘The Hedgehog’. The three on/off switches and potentiometers on the left, controlling Oscillator 1, are duplicated on the right-hand side for Oscillator 2, as are the two small touch points above. It took some days to connect all the wires, and jam everything into position, but when I finished, much to my surprise, most of the functions worked straight away! First of all, with the 3-pole SW1 (‘Keyboard off’; upper switch, front left) and the double pole SW2 (‘Oscillator on’; lower switch, front left) switches both in the ‘up’ position, the Stylophone was able to function normally; with the ‘Oscillator on’ switch down, notes played with the stylus could interact with the second oscillator; with both switches down, the stylus is not used, and the instrument is ready for full ‘Punk Console’ mode. Classic ‘stepped tone generator’ effects can be produced with the middle switches on each side down, putting VR1 and VR3 in circuit. Using the other switches on the sides, VR4 and VR5 alter the pitch or timbre of Oscillator 1 (the Stylophone oscillator); VR2 and VR6 can be used to alter the pitch or timbre of Oscillator 2, and thus radically affect the overall nature of the output. The pitch range of both oscillators can also be altered by selecting one of 6 capacitors for each. The third oscillator is configured as an LFO, connected to the control voltage input of oscillator 2, and thus affecting its pitch. There are two sets of 6 capacitors associated with the LFO, and a variable potentiometer, which control its speed and depth (visible in the first picture above). These controls actually enable it to move up into a similar pitch range to oscillator 2, creating some frequency modulation-type effects. 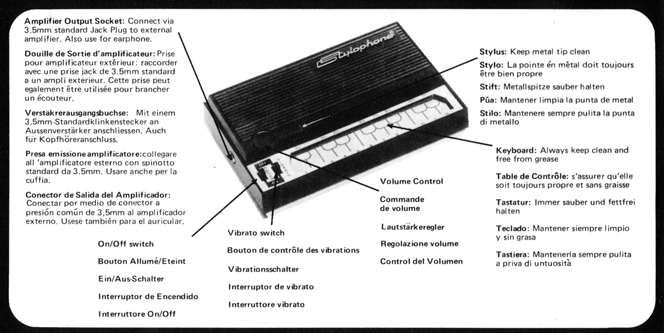 The Stylophone’s original vibrato is still available to oscillator 1. The LFO is particularly effective when used in conjunction with the two controls on the back of the instrument: ‘starve’ (right of the picture below) – reducing the supply voltage available to the oscillators – and a flashing LED, which produces a slow, steady fluctuation in pitch (centre of picture). Both of the pots have integral on/off switches. A steady LED indicates when the starve control is on, and dims as the voltage decreases. The knob on the left of the picture controls the brightness of the flashing LED, and thus the amount of effect it has. Also visible in the picture is a 2.5mm power socket, installed many years ago before rechargeable batteries became common, and before this series of modifications was planned. The three feedback controls on the front are ‘on-off-momentary’ switches, which are sprung to return to centre (off). This makes it a little easier to apply a short burst of the effect by raising the switch and letting go, rather than flicking it down, then up again. The tuning control has been extended with a length of plastic tubing so it still protrudes through the casing underneath and can be used as originally intended. This can be seen in the picture of the inside of ‘The Hedgehog’. 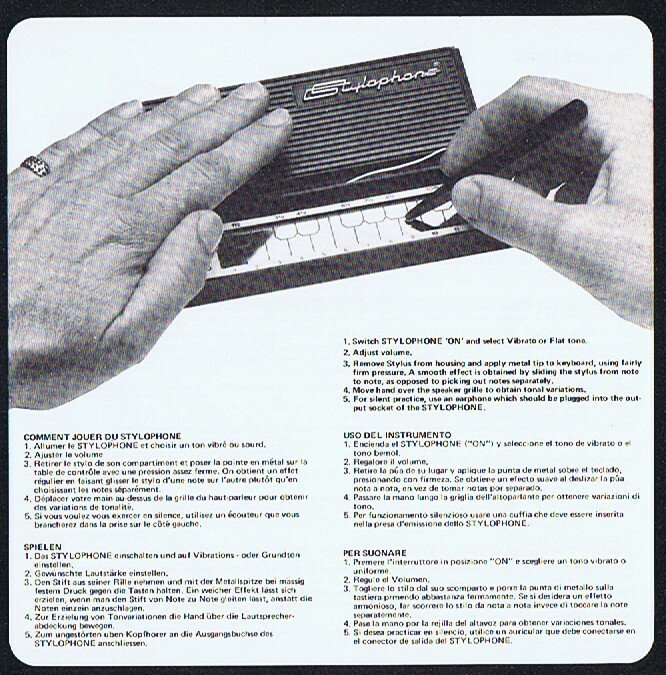 The original base of the Stylophone was replaced. It was not glued in position as it has to be opened in order to replace the battery, a 9v PP3 type. The battery leads were extended in length to reduce strain, due to the longer distance between the circuit board and the battery compartment. Playing ‘The Hedgehog’ is always a delight. Because of the wide variety of interactions between the oscillators, the amount of adjustment that can be made, and the lack of any labels to remind you what each of the controls does, successive sessions are rarely identical. Here are links to the sound files for ‘The Hedgehog’. The Hedgehog is a mono instrument, so I’ve added a stereo spread plug-in to the recordings (made in Logic) and some reverb.